OR click "log in" to register for a new account. Accurate shipping fee will only be shown when you are log in. 1. Toggle to see the price in your preferred currency. 2. 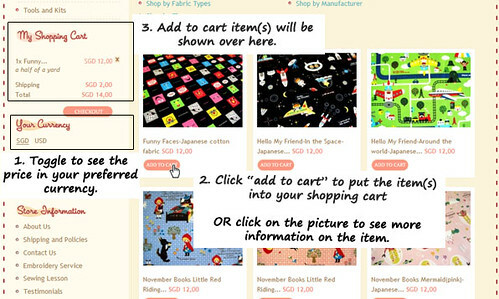 Click "add to cart" to put item(s) into your shopping cart. OR click on the picture to see more information about the item. 3. Add to cart item(s) will be shown over here. 1. Choose the base unit (A quarter of a yard (FQ) or a half of a yard) you would like to purchase in. 3. Click "buy this item" to add it into the shopping cart. 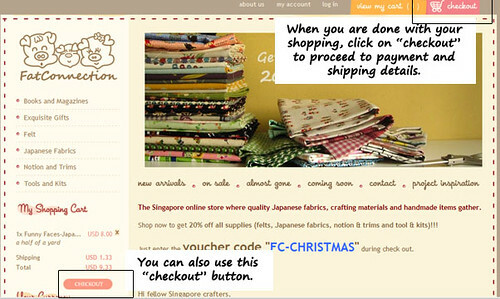 When you are done with your shopping, click on the "checkout" button to proceed to payment and shipping details. 1. 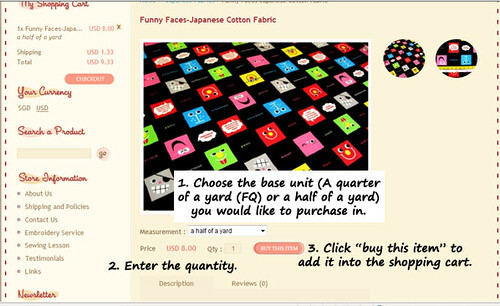 Click on the "+" or "-" to adjust the quantity if you need to make changes. Or "x" to remove item from shopping cart. 2. Enter voucher code if you have any. 3. 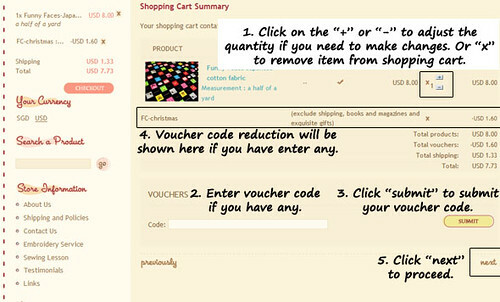 Click "submit" to submit your voucher code. 4. Voucher code reduction will be shown here if you have enter any. 5. Click "next" to proceed. 1. Choose your delivery address. 2. Click "Update" to update the addresses, if there's any changes. Or "add a new address" if it's not already in your data. 3. Leave me a note over here if you have any special instruction. 4. 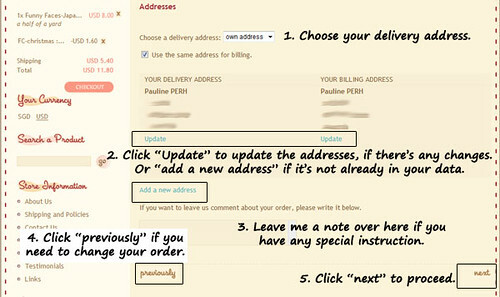 Click "previously" if you need to change your order. If it's mailing within SIngapore, there's option to opt for "regular mail" or "registered mail". 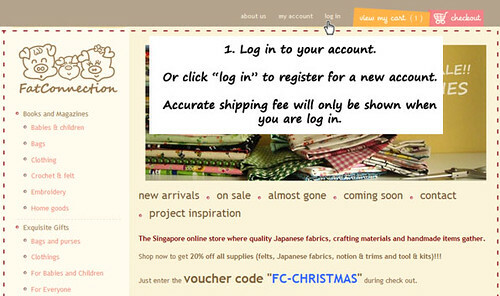 If it's mailing outside Singapore, only "international shipping" is applicable. Confirm your order by choosing "Bank transfer via DBS Bank" or "Pay by Paypal". Bank transfer is for payment by SGD only. Fat Connection's bank account details will be shown when this option is chosen. Please proceed to transfer the payment via your bank account directly. 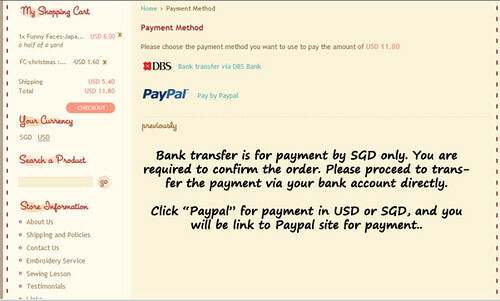 Paypal is for payment in USD or SGD, and you will be linked to Paypal site for payment when this option is chosen. Both USD and SGD are accepted. Please choose your preferred currency before making payment. If you have a coupon code, be sure to enter it before making payment too. Please make the payment within 3 working days after order has been placed, otherwise order will be cancelled. If you need more time to clear the payment, just leave me a note. For customer choosing bank transfer, only SGD is accepted, our bank details will be displayed at time of checkout and order will be sent upon confirmation of payment. You DO NOT need a Paypal account to use this option. To know more about credit card via Paypal, please click here. 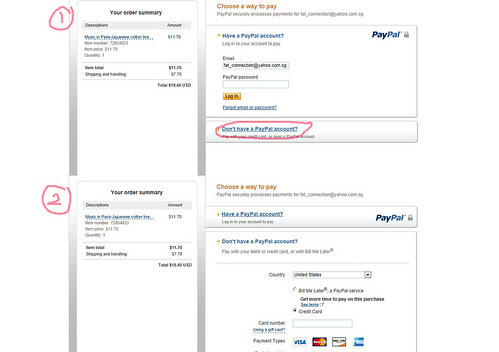 Please click Paypal as payment method and use the option "Don't have a Paypal account" under Paypal log in page.